Upon arriving at the University of Oregon’s gorgeous campus, riders were greeted with a Cycle Oregon banner that promised “good times and great rides”. And boy were they! Two solid days of perfect weather, cloud-free blue skies and blossoming Sweet Pea and Foxglove accompanied cyclists of all ages around bike paths, country roads and some of Lane and Linn County’s most bucolic scenery. There were road bikes, tandem bikes, kids in trailers, commuters, recumbent bikes and even a mountain bike or two crushing the miles on one of three routes each day. As a special rest-stop surprise for long route riders on Day 1, Franz, one of our newest sponsors, treated cyclists to fresh grilled cheese sandwiches from their Grilled Cheese Machine that looks like a cross between a food truck and an acid trip. Short and medium route riders got local blueberries and cherries – the perfect snack on a warm day. Lunch was in a shady park along the McKenzie River where people relaxed and refueled to the sounds of Sakumuna. If you’ve never heard bagpipes playing melody in a reggae band, now you have! Back at camp it was showers, a quick nap (for those who were so inclined), dinner and more great musical acts. Chapwititi, a high energy marimba band kicked us off, followed by music from The Resinators – a Eugene three piece with a tight Sublime-like sound, and finally an 8-piece band called The Essentials playing all of your favorite soul and funk hits. Day 2 started early, much like Day 1 in an effort to beat the heat. 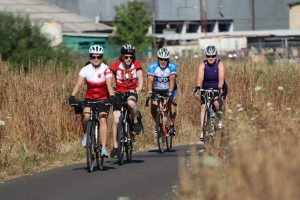 Riders set off to the south of Eugene on the city’s phenomenal network of bike paths and then onto parts of three Lane County bikeways. Riders of the long route got to see two different covered bridges and a motorboat drag racing event in progress while everyone (except the short route) got to experience a two-mile hill shortly after lunch. After conquering the hill and securing a story which will be retold for years and years, riders had a pleasant cruise back into campus where they were greeted by cheering spectators handing out ice cream. 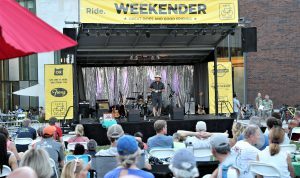 This year’s WEEKENDER was an all-around great time and the University of Oregon and the town of Eugene were perfect hosts. We don’t know yet where next year’s WEEKENDER will be held, but we’re already looking forward to it . Really enjoyed the newsletter, especially the weekender recap since I was there. I agree that bagpiper was great! Third cycle oregon since I turned 70. Each enjoyable, friendly, and motivates me to keep thinking I’m still a cyclist. Thanks for another great ride. Old guy trying to stay young!